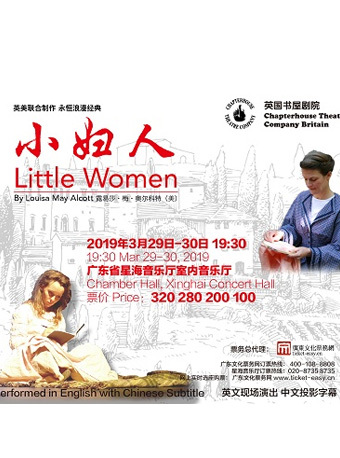 Little Woman by Chapterhouse Theatre in Guangzhou will be held at Guangzhou Xinghai Concert Hall - Chamber Hall from March 29 to March 30, 2019. In the Winter of 1999 Chapterhouse Theatre Company took its first steps towards becoming one of a number of touring theatre companies specialising in performing under the stars and at some of the most beautiful gardens the UK had to offer. The very first performance was at Herstmonceux Castle where the company performed Romeo and Juliet by the moat of the beautiful Tudor building. It was the start of an incredible 19 years which has seen the company go from strength to strength changing and adapting to new audiences and challenges every year but holding the same principals of producing warm, traditional and hopefully magical theatre in magical surroundings. It remains a pleasure and honour to create shows for both the wonderful venues we have the privilege of visiting and also the incredible audiences who join us on our summer evenings. Thank you so much from us to all of you for making it possible for us to continue to bring theatre to you.